Review: Machete Kills / It's Just Movies Review: "Machete Kills"
Machete is a spoof character from the Quentin Tarantino/Robert Rodriguez double-feature movie “Grindhouse” and the character was not only given its own movie, but, unfortunately, a sequel as well. Danny Trejo returns as the title character in “Machete Kills” and this time, Machete is recruited to stop mad men/revolutionists by the President of the United States (played by Charlie Sheen). “Machete Kills” tries to mock bad action movies, but ultimately become an even worse action movie. I think Robert Rodriguez can be a great director with a unique vision. For example, 2007’s “Planet Terror” was a great piece of work visually. But after seeing “Machete Kills,” I think Rodriguez’s luck has run out. This film offered nothing different from any of his other films – particularly the first film. When you think of Machete, you likely think of intestines, lopped-off heads and, of course, Machete telling you what he does not do. Rodriguez also carries over the same borderline jokes from the first film, when it should have been clear that the same jokes could not be used again. The biggest turn-off for me in this movie was how Rodriguez again used a fake-trailer — this time for “Machete Kills Again … in Space” at the beginning and the end of the film. Using it at the beginning already ruined the plot and although it was nicely done, it would have been much better solely at the end of the film. What scares me the most is that this sequel may actually become a possibility. “Machete Kills” has a huge supporting cast of well-known names, including: Sofia Vergara, Amber Heard, Demian Bichir, Mel Gibson, Charlie Sheen, Walton Goggins, Lady Gaga, Alexa Vega, Michelle Rodriguez, Antonio Banderas, Cuba Gooding Jr., William Sadler, Jessica Alba, Vanessa Hudgens and Tom Savini. It was interesting to see how Rodriguez used each of the characters and the two that really ruined it for me were those played by Sofia Vergara and Mel Gibson. The Vergara character is Madame Desdemona, a woman with a bullet-firing bra and a strap-on shotgun. I thought this character seemed like something a pre-teen boy would come up with after learning about sexual education. 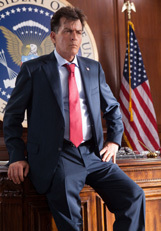 Gibson plays Luther Voz, a billionaire who wants to destroy Earth. Gibson did not seem like he was having any fun in his role and his attempts to be funny failed miserably. The saving grace in terms of acting goes to Demian Bichir, who was excellent at nailing down multiple personalities. “Machete Kills” is aimed at anybody who thoroughly enjoyed the first film or simply anybody who likes blood, guts, hot women and repetitive jokes. I understand that this movie is not supposed to be taken seriously, but it is so bad at what it does that I sadly can’t recommend this movie to anyone but hard-core fans of the original. 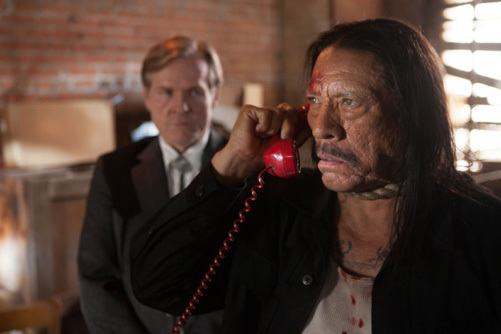 In this movie, not only does Machete not tweet … he also does not entertain. “Machete Kills” is in theaters now. Somewhat agree James, but I kind of put this into the category of the old 1950s movies done on a low budget that became classics. There were things in this movie that have never been done before. Mostly quite funny.